This annual ritual is part of the Falls Creek community welcoming and celebrating the official start of winter on June 1, 2010. Although the actual snow season doesn’t start til June 12, it’s a great way to welcome the cold temperatures and the snow and fun winter brings to the region. Even better, it’s done for a good cause. The Falls Creek based State Emergency Service (SES) will be the benefactor of the event, which aims to raise money for their services. 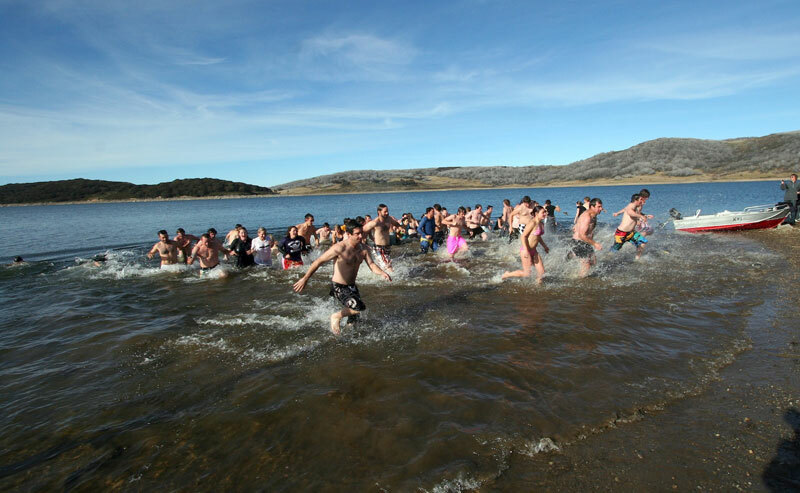 You’ll need to put on a brave face and be tough, when you become a polar plunger and immerse yourself into the icy waters, which at around 8 degrees (last year’s temps) are bound to provide a chilly experience. This quirky event began in 2008 in Falls Creek and encourages residents and visitors alike to take part in a winter ritual that’s practiced by many countries around the globe, of course mainly in the Northern Hemisphere. In Canada and America for example polar bear clubs enjoy outdoor bathing in the middle of winter to raise money for charity. So all in all, it sounds like a great idea doesn’t it? However, we’d suggest you are fit and can handle a bit of freezing water before joining a hardy group brave the chilly waters that Rocky Valley Lake embraces you with around this time of year. A more extreme version of this tradition is ice swimming, where you throw yourself into a body of water with a frozen crust of ice drifting around you. In some Nordic countries of Europe, ice swimming is closely connected to the sauna tradition, as it provides sauna goers with the opportunity to cool off quickly and to relief stress. Others just take a morning dip into frozen over lakes and rivers, to ensure a fresh start to the day. Amazingly, some of the very keen clubs partaking in this ritual actually maintain swimming holes by installing pumps, which circulate the water and prevent the holes from freezing over. You might also be interested to know that there is an actual Avantouinti (ice-hole swimming) Society in Finland. So this is a very seriously taken hobby in some parts of the world. If this is not enough to encourage you to partake in this event, there are some medical studies suggesting that ice swimming makes the hypothalamus release beta-endorphins, which will cause the feeling of well-being – does that lure you? You’ll also be rewarded with a hearty BBQ hosted by the SES for charity purposes after the swim. Is this the best luxury snow holiday in Australia?